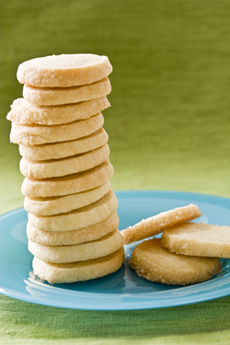 A tower delight: Larissa Raphael’s shortbread cookies, used to test the qualities of the different vanilla extracts. Photo by Saidi Granados | THE NIBBLE. This is Page 7 of a nine-page article. Click on the black links below to visit other pages. This tasty recipe is from New York City pastry chef Larissa Raphael. The “short” refers not to the size (think of the large fantail “petticoat” shortbread triangles) but to their “short,” or crumbly, texture. The texture comes from the high butter content. This concept is also used to make “short crust” pastry for pies and tarts. Authentic shortcake, a biscuit-like base for fruit and whipped cream (and not a yellow layer cake), also has a crumbly texture. Take a look at the history of shortbread. 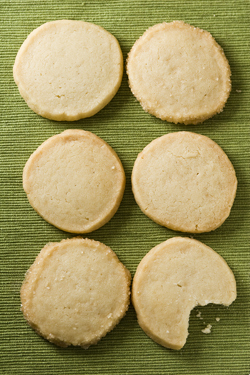 *For extra vanilla flavor, roll the shortbread logs in vanilla sugar before baking. We recommend using a coarse sugar like Nielsen-Massey’s, for good textural contrast. You can’t tell by looking, just by smelling and tasting. For our taste test, each of these shortbread cookies was made with a different brand of extract. Photo	by	Saidi	Granados | THE NIBBLE. Sift the confectioner’s sugar and the flour. Mix confectioner’s sugar, flour and butter together at low speed on a stand or hand mixer. Mix just to combine; do not overwork the dough. Add the vanilla extract until the dough comes together. Roll the dough into 1-inch logs. Wrap tightly in parchment paper. Refrigerate for 20 minutes or until dough is firm. Cut the log into ¼-inch slices. Immediately place cookies on a baking sheet, one inch apart. Bake for 10 minutes or until the cookies turn golden.